Built in 1858, The Sayre Mansion is a historic property originally used as the private estate of vice president and chief engineer of the Lehigh Valley Railroad, Robert Heysham Sayre. A distinguished community member and a powerful businessman, Sayre was passionate about his craft and profession, leading him to build his Gothic Revival estate near the railroad. In June of 1858, Sayre and his family moved in the mansion, the first private home built in the wealthy neighborhood of Fountain Hill. Completed with the main house, a carriage house was also built on the grounds in a Gothic Revival brick-style, which included a stable and living quarters, rumored to have housed Sayre's father. Methodically selecting plots to surround the mansion, Sayre continued to plan and construct organizations and institutions, many which remain today, including St. Luke's Hospital and the Cathedral Church of Nativity. An true pioneer, Sayre was also highly involved with various economic ventures that stimulated the thriving industrial trade that formed the foundation for Bethelhem, Pennsylvania. 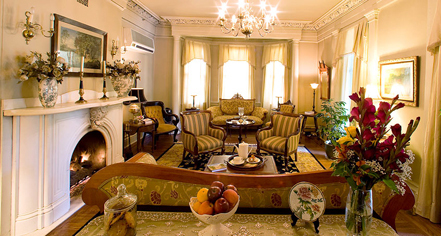 Today, The Sayre Mansion is a romantic modern destination paying respect to its significant past. 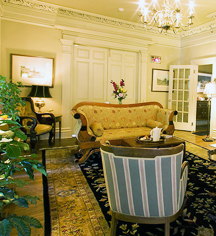 Thoughtfully-restored and enhanced to include contemporary amenities, accommodations and facilities of the mansion boast convenient luxuries and celebrate the rich heritage without sacrificing authenticity.